please mr bush do one decent thing b4 you leave, just one. PENDING another investigation. I want to know the truth about this, and then go from there. This killing is the kind of thing that has many of us up in arms. It happens alot. Vigilante type stuff. Very little gets out to the public but many help groups find out about it and often the ugly way. SASSYONE you forgot to change the color of your ink back when you resumed being CHEY and started talking to yourself again. Last edited by JDubsMom; 09-14-2008 at 05:06 AM..
Can anyone say sock puppet? I see I'm not the only one who found this to be just a little suspect. 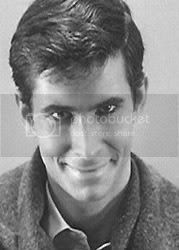 Ok, I'll bite: NORMAN BATES + SOCK PUPPET. Those posts are reminiscent of the part in the movie Psycho Norman's "mother" was sitting in the rocking chair and he was having a conversation with her shadow. For those who think amnesty is a good idea: Just think, there are millions of them here. Last edited by JDubsMom; 09-14-2008 at 07:32 AM..
No, you're not. Even scarier is that this board isn't the only place where MPD is the norm for illegal aliens in this country. Those posts are reminiscent of when the part in the movie Psycho when Norman's "mother" was sitting in the rocking chair having a conversation with her shadow. Now that's a frightening thought. bawhahahshahahahahaha .. .you're killing me Benicar, please stop, I can't breathe.